I’m getting ahead of myself though. Let’s take a step back. When you want a job at a company, what do you do? I’m guessing that you make your way over to their career website and see what openings are available. If there’s one you like, you polish up your resume and spend a few hours drafting up a cover letter. Finally, you head back to their career site, take a deep breath, cross your fingers and hit submit. You might think the company is looking at each of these resumes and carefully hand-picking applicants to come in for an interview. On average, an open role at a well known company gets ~250 resumes. 75% of these resumes came from some sort of online portal (the company’s online application, a career aggregator site like Indeed.com, etc.). Once submitted, these applications are screened by Applicant Tracking Software that scans them for keywords. At the end of the process, 10 resumes (2%) get a call back for an interview. Sounds pretty bad right? What if I told you that wasn’t even the worst part. A minute ago I mentioned that 75% of job applications come from online portals. Here’s where things get interesting. According to Payscale, 80% of job openings aren’t posted online. That means that 75% of people applying for jobs are all competing for 20% of the available positions! 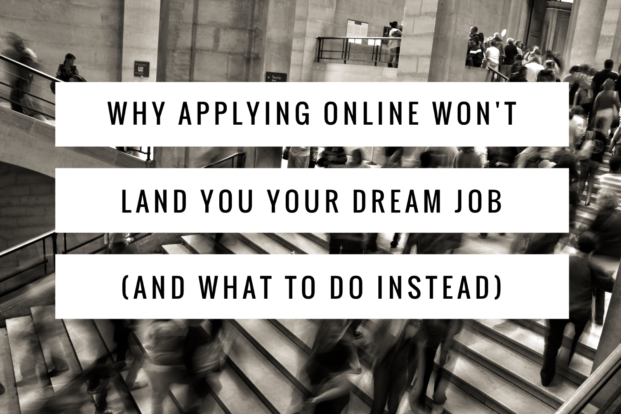 If you’re only applying for jobs online, you’re getting lost in a sea of applicants with no hope of differentiating yourself. That’s like showing up at the the most popular club in New York at 11pm with your 3 best guy friends and expecting to stroll right in. It ain’t gunna happen! The key to landing your dream job in today’s market is leveraging a laser-focused networking approach. Forget events and happy hours, your goal is to solely focus on one or two individuals who have influence over the hiring decision for you dream role. 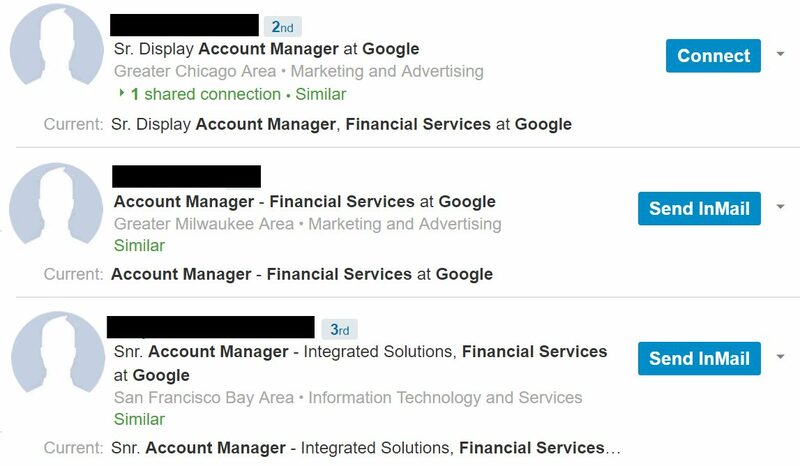 If we want a job on Google’s Account Management team that focuses on the Financial Services vertical, who better to know than someone currently working on (better yet, managing) that team. Once you’ve identified a few people that seem like a good fit, use Voila Norbert to find their email address and reach out to set up a meeting. 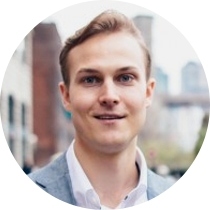 Companies hire for one reason — they are willing to pay someone to perform a function that will substantially increase the amount of revenue they bring in. When you meet with your contact, be it over the phone or in person, your goal is to uncover their largest revenue blocker. Get as much information as you possibly can. What is the biggest challenge your team is currently facing? How did this problem arise in the first place? What limitations are holding you back from solving it? What solutions have you tried to implement? Once you’ve gathered your intel, it’s time to research. Find out as much about their problem as you can. For some companies, the problem may be public (e.g. Twitter’s inability to monetize). If that’s the case, your best resources are going to be places where smart people gather online to discuss these types of problems. My two recommendations are Quora and Seeking Alpha. Quorans love discussing businesses and finding solutions. Writers on Seeking Alpha are typically financially invested in the company so they spend their waking hours researching it. Save yourself some time by leveraging their work. If the problem exists on a smaller scale, try to find connections that work in a similar setting. Run the problem by them and see what their company is doing to address it. The end goal here is to consolidate your findings into 2–3 plausible solutions . Once you have them prepared, send them back to your contact. For the initial phone call/email with the person responsible for hiring, what do you communicate to them in order for them to schedule a phone call with you…especially if they have not posted a position? Most cold call emails are not returned and calling directly will often get screened by an administrative assistant. What tactics do you use?